It’s late and the sun has long set as I unpack my gear from the back of my car in the crowded, unlit parking lot at Pat’s Island trail head. My headlamp offers the small window of light that I need to start a short walk to my campsite before I start hiking in the morning. I’ve been anxiously waiting to hike this section of trail again because it’s the very spot where I backpacked for the first time and got hooked on long distance backpacking. 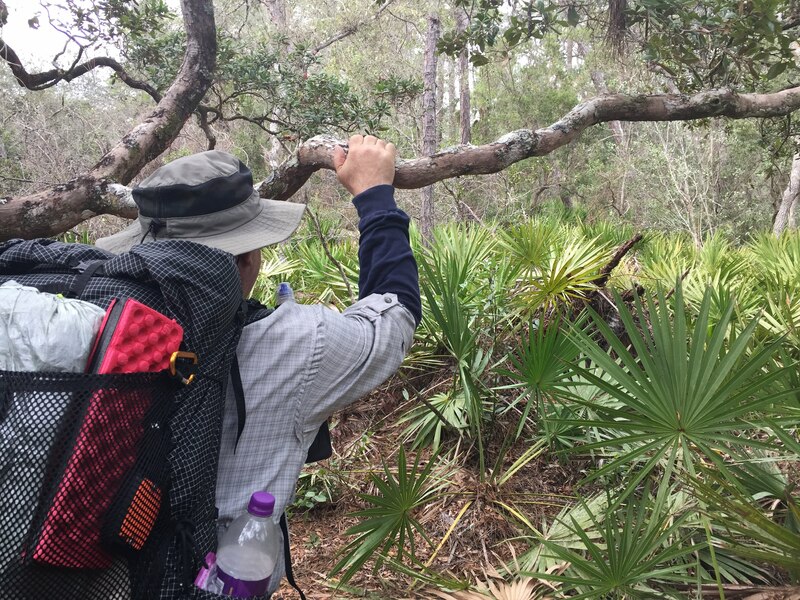 It doesn’t hurt that the trail meanders through a large variety of habitat in such a short time: Florida scrub, pine forest, prairie, and scrub oak hammocks. I find my camp less than a mile down the trail with a fire already glowing and a familiar face lit by it’s warmth. My Dad is already here and ready to hike the weekend with me. 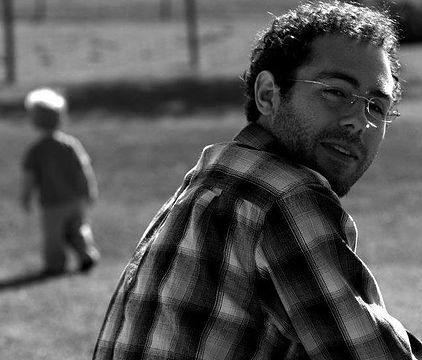 We reunite with a hug and then I setup my gear before we fill the evening with chit chat and laughter around the fire. After breaking camp, we drove to the SR19 trailhead to start the hike. I cleaned up a little garbage from the trailhead and then we set off north towards Juniper Springs. This southern part of our hike is new to me so I was ready to take in the fresh scenery. Large patches of deer moss adorned forest floor in the clearings of what was otherwise a pretty dense section of trees and underbrush. The trail was clear and easy to hike so we made it to Buck Lake quickly. The first feature on our hike was visible from the trail but we wandered off on it’s blue blaze trail just to get a closer look. Our diversion was also driven by the paw prints we were following on the trail that looked like Bobcat prints. We followed them down the blue blaze trail until we caught a better view of Buck lake. Seemingly satisfied, we backtracked to the FT and continued North. We knocked out around 5 miles before coming to Farles Prairie Recreation Area which seemed like a great spot for a stop. With established restrooms, picnic tables and water, it was hard to pass up. We broke open the food including a new cheese Dad had brought along to mix things up. Before we threw our lunch trash away, I swept the area for trash and found it cleaner than expected. Still, a few plastic water bottles and the like made their way to into my garbage bag. Before we were finished packing up, a group of guys on dirt bikes came up the road and took a break at the water pump chatting for a few minutes before speeding away. We threw on our packs and starting winding around the east side of Farles Prairie. I had high hopes that this would be a great section because it follows the open edge of the prairie. I wasn’t disappointed. As we wandered through the tall, majestic pine trees in this area we could also see to the West at great distance. 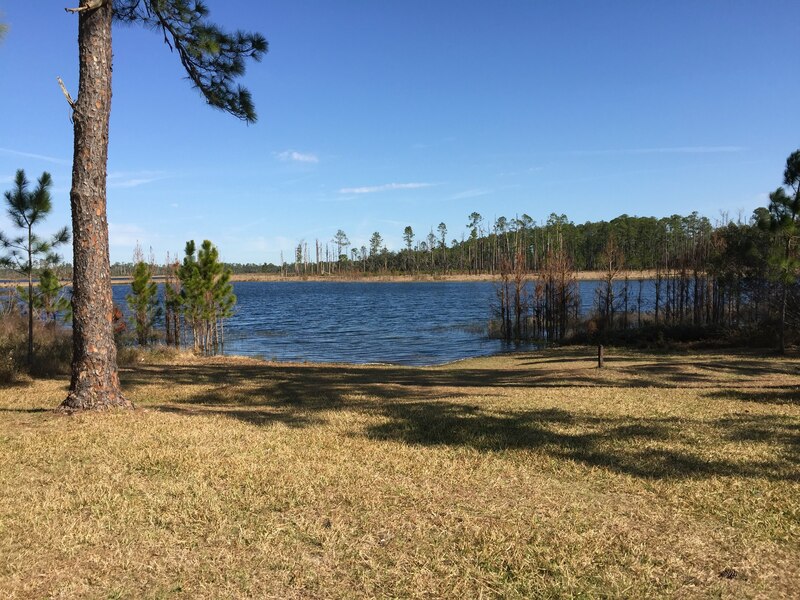 The pine trees thinned and the Florida prairie lakes glistened past the tall grasses. They were back-dropped on the far side by more of the tall pines that were currently providing us with some much needed shade. The treeline looks so small at that distance, but take one look up and you can break the illusion with the calming effect that the pines have as they sway in the wind. That sight and sound are probably second only to the babbling water of a creek or the rushing roar of a waterfall. After a short stint through some palmettos, we were walking through some dense woods and something caught my eye. A bottle. I stopped to throw it in the trash bag, but when I made my way off trail a few feet to retrieve the thing, I noticed it was painted. 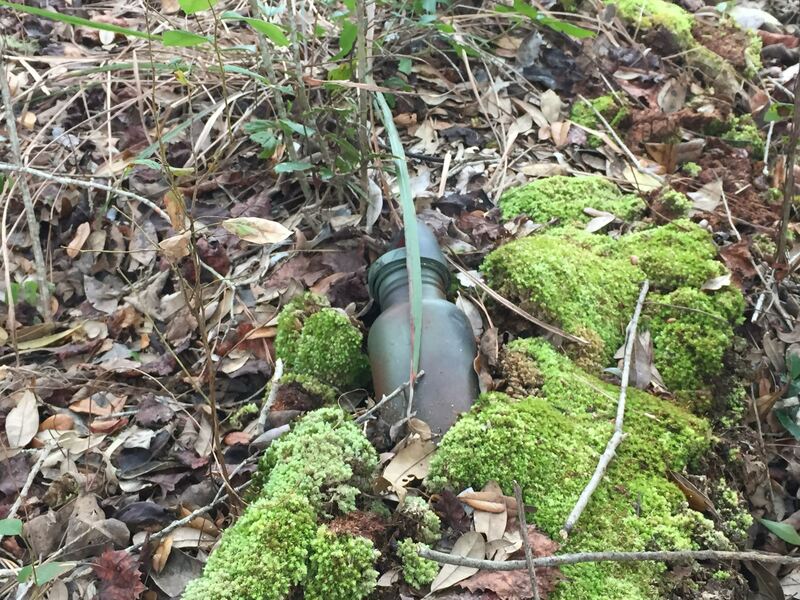 Could it be a geocache instead? It was! I opened the bottle and found a few what-nots inside like some marbles and netting of some sort along with the log book. I love finding these when I’m not looking for them! I put the geocache back in place and we followed the path to a large boardwalk with a nice view to the east. Shortly after, we crossed SR40 and made the final push into Juniper Springs campground. We arrived late enough in the day that we couldn’t really explore the springs and enjoy a swim so you can bet i’ll be back to check that out! I’m sure I’ll find time to make a kayak run down the springs at some point, too. The campground boasts an area to get snacks including some microwave food, but when we arrived it had already closed. Before we could get too disappointed, the gatekeeper told us that a pizza place would deliver to the campground – score! Dad ordered us a pizza and we set up camp as we waited for it to arrive. The campground is far from primitive as our small site had a picnic table, fire ring, driveway and bear boxes to store food. Not to mention there is a building with bathrooms and showers. We finished up camp chores and called our family since we had phone service. Then, as if on cue, the pizza showed up and I promptly stuffed myself. Now that my heart and stomach are full, it’s time for bed. I woke up to the sound of a slow sprinkle outside and the ground confirmed we had some rain. No problem, I have the antidote for morning rain: morning coffee. I carefully setup my stove in the vestibule of my tent and made some coffee. The warm, dark liquid chased away the chill in the air and the melancholy light outside. We broke camp and I tossed the bag of garbage I had been collecting into the dumpster at the campground on our way out. Goodbye, Juniper Springs! 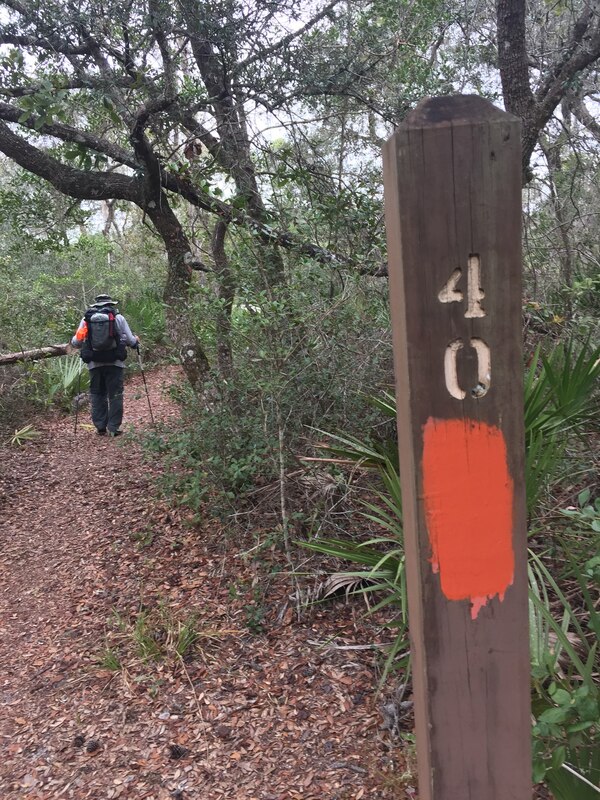 We soon crossed the boundary into Juniper Prairie Wilderness and began to experience the sandy trail that typically accompanies the Florida scrub. The last time I hiked the scrub in this wilderness it was blazing hot in the middle of August so I had no complaints about the cloud cover and mild rain that was currently coming and going. If I had one complaint, it would be that it’s hard to take photos in the rain. I didn’t take many photos today because it was too wet outside. I wish I could have taken photos of this section so I could reminisce with my wife about our hike through this area a few years ago. Still, the rain wasn’t bad and the sun wasn’t killing us so I’m happy to live in the moment and reminisce without the photos. We soon discovered that the mild rain had bolstered the upcoming water crossing. Whispering Creek lived up to it’s name as we walked right up to the water without hearing it. With a bit of careful balance and a small hop, we made it across on the scattered logs without getting soaked. After about a mile and some scenic prairies we came across Whiskey Creek and crossed it without fanfare as well. We passed a few campers on our way north and stopped to chat briefly with a few of them. They were concerned that we were headed to Hidden Pond where they had stayed the night and shared stories of a close encounter with a bear. Apparently a bear has learned that campers have food and is frequenting the area. They said he was very close to the camp and not bothered by them at all, though he didn’t approach their tents while they were occupied. This comes as no surprise if you read the posted warnings at the trail head that lead into this area. We were already practicing good protocols for food and leave no trace ethics. We also weren’t planning to camp there tonight so we don’t have to change our hiking plan for the day. We thanked them and I made a “bear burrito” joke to the two hammock campers as we left that was well received but also had a tinge of nervous relief in the laughter that followed. POST-HIKE BEAR UPDATE: They closed Juniper Prairie Wilderness, evaluated the situation, and caught the bear checking tents despite the absence of any attractants. Combined with the fact that the bear was unafraid to approach humans and undeterred by their presence, the forest service announced they had euthanized the bear before re-opening the wilderness to camping. A harsh reminder to practice good food protocols and leave-no-trace. Tips on being in Bear country can be found here. This beautiful spring fed pond is in a beautiful spot. The trail opens up to a clearing where it sits and there is a string of camping areas just off to the side. This is where my wife and I camped a few years ago that kicked off this love affair with backpacking. My Dad and I decided to stop and have lunch here despite the bear warning. I was happy to spend some time here and glad to see the area looked pretty similar to the way it did a few years ago. I was concerned that it might not be the same due to a large volume of camping. Glad to see that wasn’t the case. We kept a watchful eye out for bears as we snacked on some lunch and took a break. The weather was starting to clear so we were able to shed our rain gear for the rest of today’s hike and stow it away before we left. The rare Scrub Jay sang us his songs and I managed to capture this photo despite the rain! The following section of trail held the variety I spoke about earlier. Crooked scrub oaks, pines, prairie and more dense scrub appeared as we hiked. We were also greeted by a small host of Scrub Jays. The blue birds are unique to this habitat and often curious. They followed us as we hiked flitting from branch to branch among the scrub. A group of them had done the same when my wife and I hiked these few miles and I remember it being one of my favorite moments. I was happy to share the trail with them. 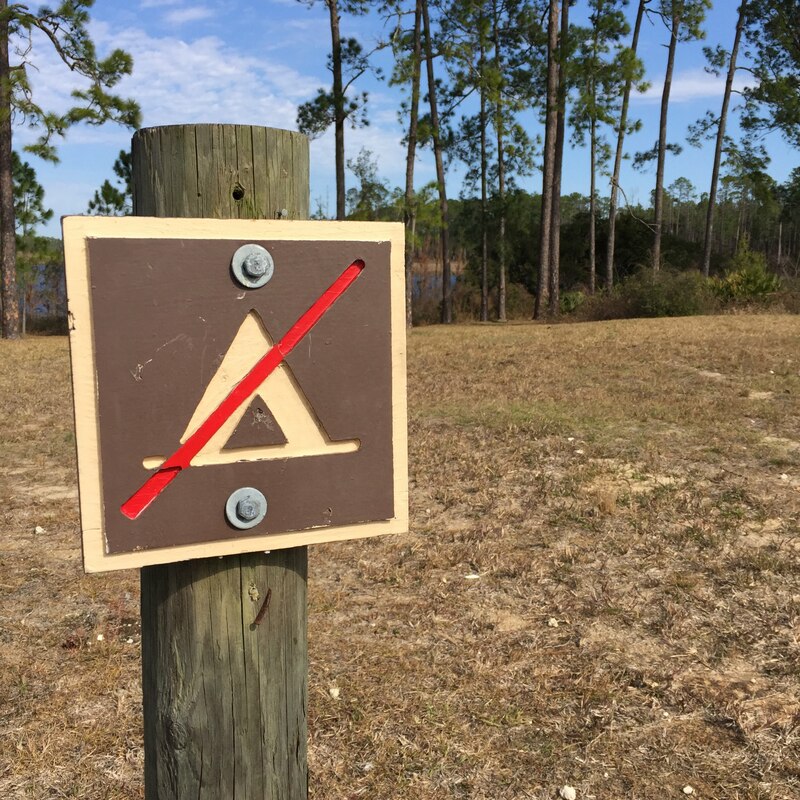 Shortly after, we passed the markers where the Yearling Trail intersects with the Florida Trail and then passed the signs for the North end of Juniper Prairie Wilderness. A few steps later we finished 23 miles of trail and arrived back at Pat’s Island trail head. If you’ve never hiked this area, I highly recommend Juniper Prairie Wilderness. Head out to the Yearling Trail for a day hike if you don’t have time or desire to hike the whole thing. It’s a beautiful area teeming with wildlife. I’ll be back to this area soon to hike the section just north of Pat’s Island. Until then, #hikewithheart my friends. Always a great section to hike! I got more information in the latest FTA magazine about the bear—what a sad situation. Ya, sad situation. Maybe if it wasn’t a wilderness area they could have installed bear boxes or the like but I guess this was the only option they felt would work. Thanks, Misti!